ITC - Examine CIPA And Internet Safety Guidelines - Integrating Technology In The Classroom from SimpleK12 on Vimeo. Gartner, Inc. delivers technology-related insight necessary for clients to make the right decisions based on Gartner's interactive Magic Quadrant and Hype Cycle. Through the resources of Gartner Research, Gartner Executive Programs, Gartner Consulting and Gartner Events, they work with clients to research, analyze and interpret the business of IT within the context of their individual mission and goals. The organization was founded in 1979, in Connecticut. Gartner has 6,600 employees, including more than 1,500 research analysts and consultants. With this insight, evident support can be provided for Lakeside School District. Gartner's interactive Magic Quadrant features enable you to create a view and reflect organization's goals and mission. In addition, the quadrant can provide concise analyses and lead to an effective decision making. 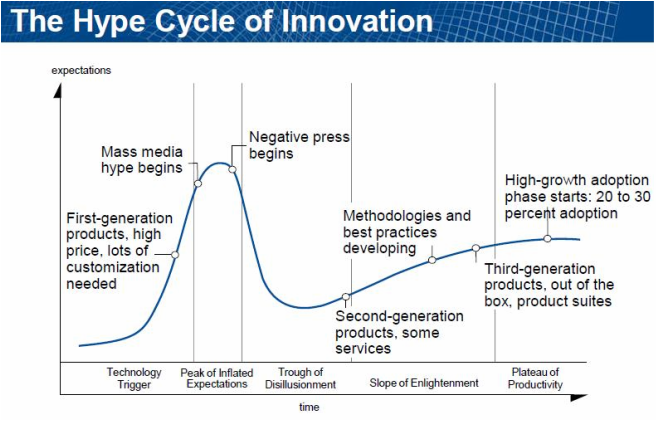 Ensures technology is a part of the five key phases of a technology's life cycle. "Technology Trigger: A potential technology breakthrough kicks things off. Early proof-of-concept stories and media interest trigger significant publicity. Often no usable products exist and commercial viability is unproven. Plateau of Productivity: Mainstream adoption starts to take off. Criteria for assessing provider viability are more clearly defined. The technology's broad market applicability and relevance are clearly paying off." Gartner will be in understanding and creating an effective model for enterprise architecture with support from consultants and research analysts. Global Literacy: Awareness, social and cross-cultural skills are valuable, therefore allowing connection of Skype with other countries to enhance the language acquisition for students in Lakeside. Information Technology Literacy: The tools that we use to create or access media that contain information are evolving daily. Understanding which tools to use is an essential skill. As a result, educators value critical skills, problem-solving, creativity and innovation, and the members of Gartner, Inc. share the same value. Media Literacy: IM streams, blogs, streaming video, web conferences on Skype – information is being channeled through various media devices with the guidance of Magic Quadrant. The ability to navigate and interpret those media in context, as well as the ability to use those media effectively to communicate are critical skills, problem-solving, creativity and innovation are valuable. Everyone on board on the mission and vision by assimilate the mindset of enterprise architecture into your organization and develop a culture in which it is valued and used because technology is advancing at a rapid pace. Agility is critical in the 21st century. Communication & Collaboration: A connected world requires better communication skills, and the ability to dynamically team to accomplish tasks. As a result, Gartner offers online support and webinars for clarify of concerns. Each client has a log in number and access to the online resources. In addition, continuos support is provided by the consultants and analyst. They will focus on using technology to drive business value and reduced expenses and/or increased income, which is the goal for Lakeside School District. They will guide you into effective approach to managing complexity of technology-related decisions based on the Quadrant and Hype Cycle. "Why Gartner Is Critical." Gartner. Web. 9 Feb. 2015. <http://www.gartner.com/technology/home.jsp>. 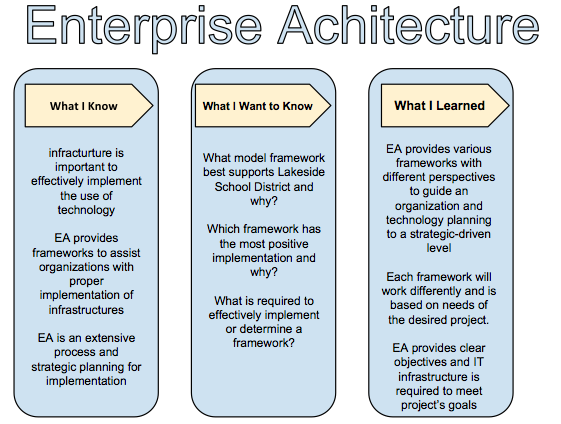 As we continue to develop our understanding of Enterprise Architecture (EA), the KWL chart allows us to become reflective learners and share our insight and ponder on how the frameworks and infrastructure could be aligned to our own school district. I've spoken to various IT department leaders and Laura Spencer, LUSD's Tech Director. They all seem intrigued on the topic as I am and look forward to having more clarity on the organizational flow. Once, we have developed a deeper understanding and have the confidence in applying EA frameworks to the school district's mission and vision on technology for the 21st century. Bernard, Scott A. (2012-08-13). An Introduction to Enterprise Architecture: Third Edition (Kindle Locations 487-488). AuthorHouse. Kindle Edition.